Idaho vs. Maine Potato Levity. Special Offer: FREE Organic Adirondack Blue Potatoes. Video: Sorting Organic Dorinny Seed Corn on Wood Prairie Family Farm. Other Voices: Along the Way of the Dirt Farmer By Tom Willey. Notable Quotes: Aldo Leopold on Right Action. Mailbox: Phillipines Needs Seeds and Normal as Abnormal. New Wood Prairie 'Winter 2017' Catalog Soon To Be in Your Mailbox. Keep an eye out for our brand new catalog! In it we feature two new amazing potato varieties you will want to try: Huckleberry Gold and Yukon Gem. View our new Virtual Flip Catalog right now. Back here in Northern Maine, we’ve seen a fast and dramatic shift away from what was once a warm Fall. There has been a radical about-face, turning things quickly into a snowy and cold winter. Our early snow from late last month has not only failed to melt, but has been supplemented by additional snows. What snow has fallen since Thanksgiving has been preserved by our low temperatures. Last night the house shook from the steady 30 mph winds. This morning - with the winds still howling - the thermometer read -10ºF. All day today, the sun was out but the temperature struggled to rise above zero. Wherever you are, we hope you are snug and warm and your firewood is plentiful and dry. All the best to you and your family for the upcoming Holidays. Thanks so much for your patronage and friendship. .Idaho vs. Maine Potato Levity. 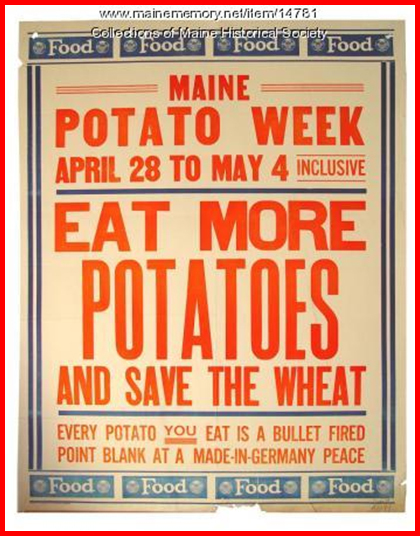 Maine has had plenty of decades to develop its kindly sympathy for potato upstart Idaho. A century ago, when Maine and Aroostook County were known as The Potato Empire, struggling Idaho was still pulling out sage brush and trying to figure out where they could get water to grow a mighty crop such as potatoes. Times may have changed, but Maine’s rivalry with the good folks of Idaho has not. Enter Elaine Ambrose’s humorous article entitled, The Great Potato Debate: Idaho Vs. Maine in which she carries on rivalry banter with Maine writer Molly Stevens who grew up on a potato farm in Aroostook County, Maine. Elaine herself grew up on an Idaho potato farm. Holiday meals won’t be complete without a cube of real butter melting in the center of a heaping bowl of mashed potatoes next to an industrial-sized pitcher of homemade gravy. These simple pleasures make life worth living. My grandparents and parents were potato farmers in Idaho, and I knew that the state produced the best spuds in the world. Recently that opinion was challenged when I met Molly Stevens, a humor writer from Bangor, Maine. She’s proud of her state’s potatoes and had the audacity to send me a list of reasons Maine spuds are better than Idaho potatoes. 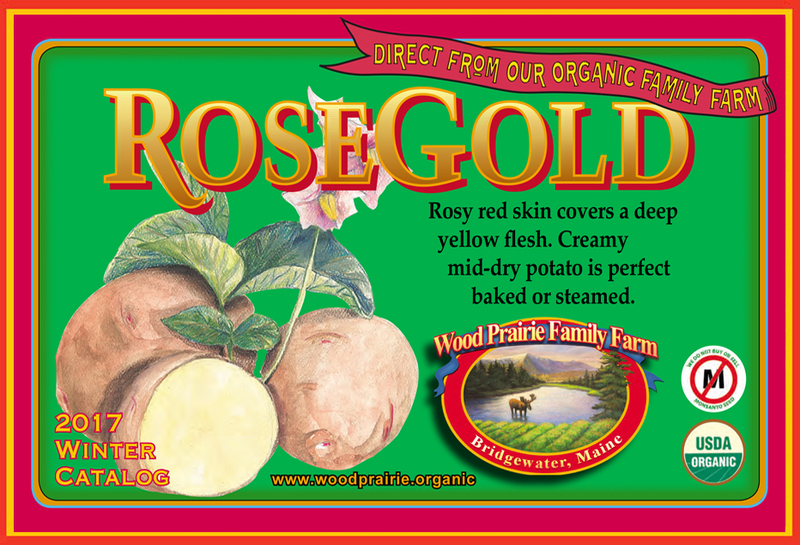 Click Here for our Wood Prairie Organic Specialty Potatoes for the Kitchen. World War I Poster From 1917. Save the wheat, eat potatoes. Organic Adirondack Blue. Striking new addition to the Wood Prairie team. Special Offer: FREE Organic Adirondack Blue Certified Seed Potatoes. One of the new potato sensations in the USA today comes from our friends at Cornell University. Joining fellow Cornell alums Elba and King Harry. is the breathtakingly beautiful Adirondack Blue. Now, after growing Adirondack Blue for several years in our Organic Variety Trials we have decided Adirondack Blue meets our two main criteria for worthy potato varieties: excellent culinary quality and suitability for organic growing. Accordingly, we have Adirondack Blue added to our Wood Prairie lineup. Supplies for this wonderful variety are limited so please place your order now. You can earn yourself a FREE 1 lb. 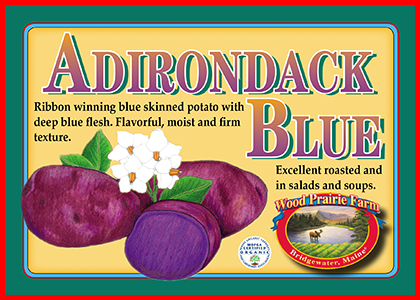 sack of our Organic Adirondack Blue Certified Seed Potatoes (Value $11.95) when your next order totals $39 or more. FREE Organic Adirondack Blue Certified Seed Potatoes - offer ends 11:59 PM on Monday, December 19, 2016, so please hurry! Please use Promo Code WPF401. Your order and FREE Organic Adirondack Blue Certified Seed Potatoes must ship by May 7, 2017. Offer may not be combined with other offers. Please call or click today! Organic Dorinny Sweet Corn. Amy Gerritsen sorting on new YouTube video. One of the big inside jobs for us in late Fall is doing the final sorting of the organic seed corn we grow in isolation here on Wood Prairie Family Farm. Prior to this step we mechanically harvest the corn cobs from the field, finish drying them down in the shed, shell the kernels from the cob, then separate the kernels from the dust and cob trash with various pieces of manufactured seed cleaning equipment. The final step - that age old task of manually inspecting and tossing out the imperfect corn kernels - is done on our hundred-year-old “single sorting table” originally designed for sorting similarly-large-sized dry beans. 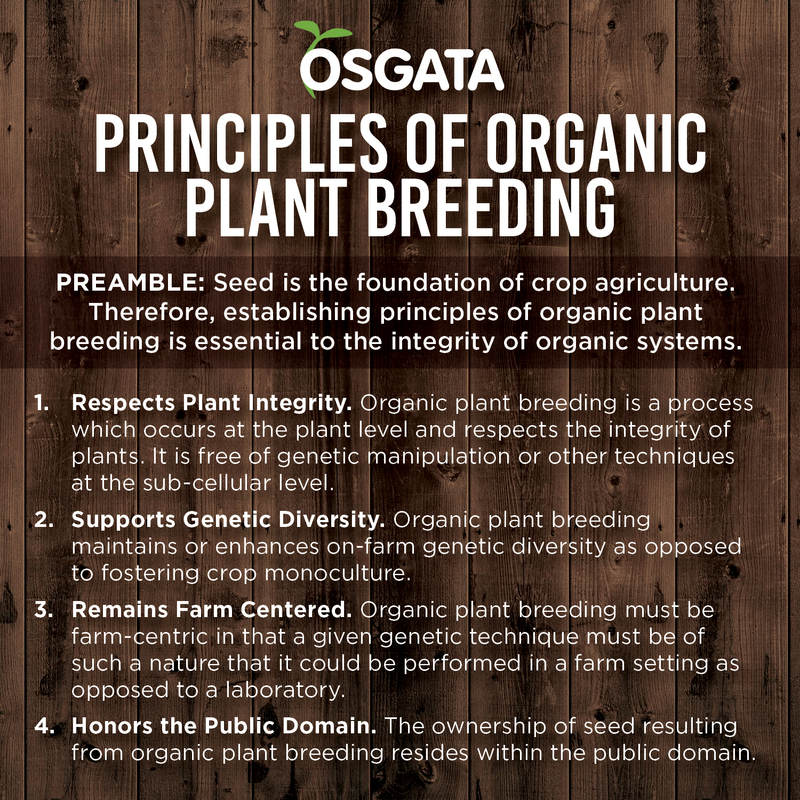 While indisputably a drawn-out process, this important final step deserves a lot of the credit for our being able to sometimes achieve 99% germination as well as very vigorous growth from our organic corn seed. In this new You Tube video (1:18) you can watch Amy Gerritsen complete that final seed corn sorting step. TD Willey Farms Tom Willey. Wise words from a retiring Agrarian Elder. Other Voices: Along the Way of the Dirt Farmer By Tom Willey. After a career of farming in California’s Central Valley spanning over forty years, Tom and Denesse Willey planted their last organic crop back in August with a design to rapidly cycle down towards a well-earned retirement. We’ve known the Willey’s for twenty years. With their successful farm and their mentoring of others, they have had a huge impact on organic farming in California and beyond. Our family has visited their farm once. Now we’re looking forward to them finally having the chance to visit Maine and take in our farm as well. At both Agrarian Elders Gatherings - in 2014 and 2016 - Jim and Tom were roommates at Big Sur. In two photographs accompanying Carol Pogash’s article in the New York Times about the first Agrarian Elders Gathering, Tom & Jim were captured in soil-centric conversation. Tom has always been a thinker and student of agriculture. He has hosted a local monthly radio program on KFCF in Fresno for many years – Down on the Farm with Tom Willey - in which he invites guests to be interviewed on a broad range of agricultural topics. Earlier this Fall, Tom gave what amounted to his farewell speech to organic farmer colleagues in Auburn, California. His presentation, Along the Way of the Dirt Farmer, is must read for everyone interested in organic agriculture and concerned about its future, written by one of its wisest pioneers. Heat oil in large skillet over med-high heat. 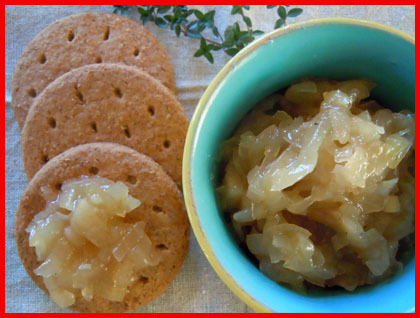 Add onions, shallots, sugar and bay leaves; cook, stirring occasionally, until onions are golden, 20 to 25 minutes. Add remaining ingredients, and bring to a simmer; reduce heat to low. Cook, stirring occasionally, until liquid is dark golden and syrupy, about 20 minutes. Immediately transfer to jars. Refrigerate in an airtight container up to 1 month. I am sure you can NOT provide potato seed to us as we are in the Philippines. I am a 63 year old American citizen very familiar with farming. We have a very big opportunity to provide healthy organically grown potato seed and ready for market potatoes, especially those ideal for french fry and potato chip production. I would like a few references and suggestions regarding how and whre I could start a proper growing facility. We just do NOT know how we can obtain the seed potatoes we need. Since you mention a particular interest in potato varieties for chipping or frying, you might want to look into partnering in this potato variety project with processor(s) which will eventially be processing the potatoes. Wow - 16 inches of snow! Is that normal? We stopped using the word "normal" sometime after we stopped using "natural". Back in the good ole days, like clockwork, we used to get our first snowfall that stayed until April the week of Thanksgiving. In the last 15 years - with warmer Falls - the month between Thanksgiving and Christmas often alternates rain then snow then rain then snow making our world icy as never before. Two years ago we got our first snow (1 foot) in early November. Last year the first foot or two came in early December before the ground had really frozen and under the blanket of snow the ground never really did freeze much last winter. With the warmer Falls we also see lingering winter weather into what used to be Spring. Several times we've had April weather in March followed by March weather in April. Our new "normal" is abnormal by any historical measure going back to 1900 which has been our community human knowledge base over the last forty years. Our old neighbor 'Doss' was born in 1899. His birthday was October 6. One Fall when he was young it snowed on his birthday and that snow didn't leave until the next April. Lots of potatoes never got dug that year. Fortunately, that's a true Hundred-Year event that our human knowledge-base can vouch for as not having repeated itself going back to when Doss was born.